Authors:John Roy Burr, John R. Burr, John R. Burr Ph.D., Milton Goldinger, Milton Goldinger Ph.D. 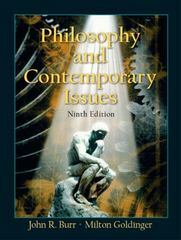 Philosophy and Contemporary Issues 9 Edition One of the most successful volumes in its field over the last 20 years, Philosophy and Contemporary Issues introduces today's readers to philosophy with timely, approachable readings of philosophical significance. The authors strive to demonstrate how philosophy illuminates and helps solve some of the important problems facing contemporary man, and they encourage readers to engage in philosophizing themselves. This book successfully makes the subject interesting and intelligible for readers encountering philosophy for the first time. Essays address freedom and determinism, morality and society, state and society, and knowledge and science. For individuals interested in an accessible introduction to philosophy.